Love driving! In fact, I take off for a drive almost every afternoon, more concerned that I have my camera than snappy apparel. My apparel needs to be more of the North Idaho “practical,” since the drive may include some short hikes through deep snow like yesterday or up a muddy trail. Your mention of Marshall Field’s hits on some family nostalgia. My grandmother Lillian Short met my grandfather Frank Halter at Marshall Fields. She was my Aunt Anna Douglas’ beautician, and apparently, Aunt Anna thought Lily would be a good catch for her brother. Ironically, this same Aunt Anna lived in Manistee, Michigan. When her husband William died, he left her to take over the family business, which involved a lumber mill, salt block and a railroad. Their house is on the historic register in Manistee. When Mother’s mother Lily died in Wallace in 1924 and her dad took the little girls on to the Trinity Valley of Northern California where he mined for gold, Aunt Anna worried so about those girls that she had her chauffeur drive her out to California in a Moonstone blue Oldsmobile to “rescue” them. Mother was 6 at the time. Aunt Anna was taking business courses in San Antonio, so that’s where my mother and her sister lived for three years, attending a Catholic boarding school. 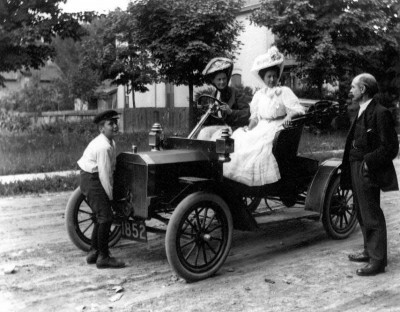 Aunt Anna definitely had the means to hire her own chauffeur.